The Pittsburgh Penguins hold the longest active streak for consecutive playoff appearances in the NHL with 13 seasons under their belt. However, the fate of that streak hung in the balance until the 81st game of the 2018-19 regular season, and facing the New York Islanders in the first round of the Stanley Cup Playoffs remained a toss-up until the end of regulation of the final game of the season against the New York Rangers. The puck drops at Nassau Coliseum on Long Island on Wednesday for the next race to 16 wins, and possibly a sixth Stanley Cup banner for the rafters at PPG Paints Arena. But before a new chapter in Penguins’ history is written, let’s take a look back at some of the memorable moments of Pittsburgh’s last 12 Stanley Cup quarterfinal battles. In 2007, Pittsburgh’s young squad, led by Michel Therrien and alternate captains Sidney Crosby, Sergei Gonchar, and Mark Recchi, finished fifth in the Eastern Conference and third in the former Atlantic Division, which was comprised of the Penguins, Islanders, Rangers, New Jersey Devils, and Philadelphia Flyers. The playoffs were brand new territory for 13 members of the squad, including Crosby, Evgeni Malkin, Jordan Staal, Max Talbot, and Marc-Andre Fleury. The team’s inexperience showed during the first meeting with the Ottawa Senators at Scotiabank Place on April 11, 2007. Pittsburgh was down 6-2 late in the final frame, but Crosby wouldn’t go quietly into the night. The Penguins earned a power play with under two minutes left in the game, and even with a comeback out of the question, Crosby didn’t sit back and let time expire. With just 50 seconds left, he took a centering pass from defenseman Gonchar, sidestepped a Senators player, and popped the puck behind Ray Emery in a last-ditch effort to even the score. Though it wasn’t one of Crosby’s flashier goals, it was a milestone nonetheless. The Senators ended up winning the game 6-3, and the series in five games. Finally beginning to gel as a young team, the Penguins improved their standings in the 2007-08 season to finish second in the Eastern Conference and capture the former Atlantic Division title. Crosby was promoted to captain, signifying the solidification of team leadership. The first round of the 2008 Stanley Cup Playoffs was a rematch with the Senators, and this time the Penguins were prepared. They took the first game in a 4-0 shutout on home ice and followed it up with a 5-3 victory in Game 2. The train kept rolling at Scotiabank Place with the Penguins claiming a 4-1 victory and a 3-1 conquest in Games 3 and 4, respectively. In the 4-0 sweep of the Senators, 10 different Penguins scored goals: Crosby, Malkin, Gonchar, Staal, Talbot, Gary Roberts, Petr Sykora, Ryan Malone, Marian Hossa, and Jarkko Ruutu. Additionally, during this series, forward Tyler Kennedy and defenseman Kris Letang laced up the skates for their first NHL playoff games. The 2008-09 regular season was a turbulent one for the Penguins. Coming off a gut-wrenching Stanley Cup Final defeat, the Penguins seemingly lost their motivation to win. By midseason, making the playoffs was not a sure thing, and personnel changes were made. Dan Bylsma replaced Therrien as head coach in February and pushed the team through a phenomenal stretch run to finish a respectable fourth place in the Eastern Conference and second place in the former Atlantic Division. However, the first round of the 2009 Stanley Cup Playoffs brought the Flyers to town, a matchup that is was full of anything but brotherly love. Going into Game 6, the Penguins were leading the series 3-2, but by the beginning of the second period, it looked like Game 7 was a given. The Flyers had a three-goal lead on the Penguins, but that didn’t stop Philadelphia’s Daniel Carcillo from dropping the gloves with Talbot. Although he lost the fight, Talbot had the last laugh as he not only flashed a shushing finger to the rowdy crowd, but his team rallied behind him to score five unanswered goals, win the game, take the series, and eventually hold a victory parade through the heart of Pittsburgh. Things were looking status quo for the defending Stanley Cup champions as they finished the 2009-10 season fourth in the Eastern Conference and second in the former Atlantic Division yet again. Back-to-back victories weren’t out of the question, especially with the same coaching staff leading the way and a relatively unchanged roster from the previous playoff run. For the third time in four postseasons, the Penguins and Senators would meet again in a rubber match. Which team would take two out of three? After dropping the first game, the Penguins strung together three wins in the hopes of closing out the series in Game 5 on home ice. That dream did not happen. Instead, the game was tied at 3-3 at the end of regulation and would take an additional 47 minutes of triple overtime to break the stalemate. Ottawa’s Matt Carkner chipped the puck past a tired Fleury, and the Senators lived to fight another day. The Penguins Marc-Andre Fleury hoped to redeem himself after a 4-3 triple-overtime loss against the Ottawa Senators. The Penguins were still ahead in the series and hoped to get the job done in Game 6 in Ottawa. However, a sense of deja-vu took over at the end of regulation when the game was once again tied 3-3 and would require extra time. The Penguins’ Pascal Dupuis found the net just under 10 minutes into the first overtime frame, locking up the round, and the rubber match, for Pittsburgh. The Penguins were in familiar territory for the third season in a row. Once again holding onto the fourth spot in the Eastern Conference and the second spot in the former Atlantic Division, tradition seemed to say that they would make it out of the first round without a problem, and have the potential to repeat their success from 2009. But a few key pieces of the puzzle were missing: Crosby and Malkin. Captain Crosby missed the second half of the regular season, the 2011 Stanley Cup Playoffs, and the first 20 games of the 2011-12 season with concussion symptoms. 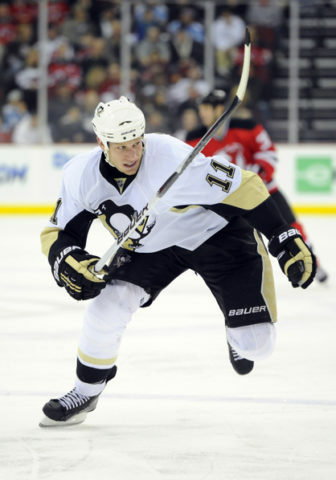 Malkin suffered torn knee ligaments in February, causing him to miss the playoffs, as well. In the end, the 2011 Playoffs were nothing to write home about as far as the Penguins were concerned. They faced the Tampa Bay Lightning and were able to push the series seven games, but were unable to do much else. On an individual level, forwards James Neal and Eric Tangradi, and defenseman Ben Lovejoy played their first NHL playoff games on April 13, 2011, and, Alex Kovalev, in his second stint with the Penguins, scored his 100th career playoff point on April 23, 2011. The 2011-12 Penguins were in a rut. For the fourth season in a row they finished fourth in the Eastern Conference and second in the former Atlantic Division. And an old familiar foe, the Flyers, were on their way to town. After dropping the first three games of the series, things went from predictable to panic mode in less than a week. Game 4 in Philadelphia was a must win to keep the Penguins alive, but after two crushing 8-5 and 8-4 losses in Games 2 and 3, did the Penguins have it in them to make a comeback? Game 4 wasn’t just a comeback, it was a 10-3 blowout in Pittsburgh’s favor. All the big names hit the scoresheet, like Crosby, Malkin, Letang, Neal, and Dupuis. Staal’s contribution, however, was the most impressive, racking up his first career playoff hat trick during the first and second periods of the game. Despite the impressive performance in Game 4 and a 3-2 close call win at home in Game 5, the Penguins weren’t able to stage a comeback, and Philadelphia captured the series in six games to move to the Eastern Conference semifinals. The 2012-13 season broke the conventional mold the Penguins had been stuck in for the last four years. Due to a partial lockout, there were only 48 games in the regular season. This short schedule worked in the Penguins’ favor, as they finished in the top spots of both the Eastern Conference and the former Atlantic Division. The Penguins were set to meet the Islanders in round one, a matchup that could prove unpredictable given the teams’ history with games that turn ugly. Pittsburgh set the tone for the series in Game 1, shutting out New York 5-0 at CONSOL Energy Center. The victory was Fleury’s sixth career playoff shutout, which tied him for the franchise record at the time. He would earn four more during his career with the Penguins’ to set the new franchise playoff shutouts record of 10. Despite his performance in Game 1, Fleury was replaced by backup Tomas Vokoun for Games 5 and 6 of the series due to his inconsistency in net. Vokun led the Penguins’ to victory in both games, even posting a 4-0 shutout of his own in Game 5. 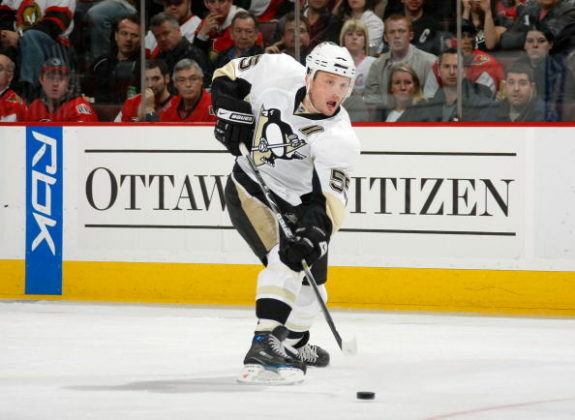 Pittsburgh advanced to round two on an overtime goal from defenseman Brooks Orpik in Game 6. The 2013-14 season brought changes across the league. Teams in both the Eastern and Western Conferences were split into new divisions, creating rivalries in both the regular season and playoffs. The Penguins were part of the new Metropolitan Division in the East, which included all of their former Atlantic Division rivals, as well as other foes like the Washington Capitals. The shakeup didn’t affect Pittsburgh’s performance. They finished first in the new Metro Division and second in the Eastern Conference. For that, they punched a ticket to face the Columbus Blue Jackets in the first round of the playoffs. This season was the Jackets’ first in the Eastern Conference, having moved over in the offseason changes. There wasn’t a rivalry between the two teams yet, but this first playoff series between them would be the spark that started the fire. The series went six games, with the Penguins taking the edge, and five of them ended in a score of 4-3. The close, hard-fought battles that included a Penguins double-overtime loss in Game 2 and a Malkin hat trick in Game 6 led to animosity between the two clubs that still exists today, and could be revisited this postseason if both teams make it out of the first round. By the 2015 postseason, Crosby and Malkin were old hands at the playoffs. Aside from injury-prone 2011, Malkin had never missed the playoffs in his career, and Crosby hadn’t missed them since his first season in the league. When the Penguins met the New York Rangers in the first round that year, the 28- and 29-year-old, respectively, were able to add more accomplishments to their ever-growing resumes. 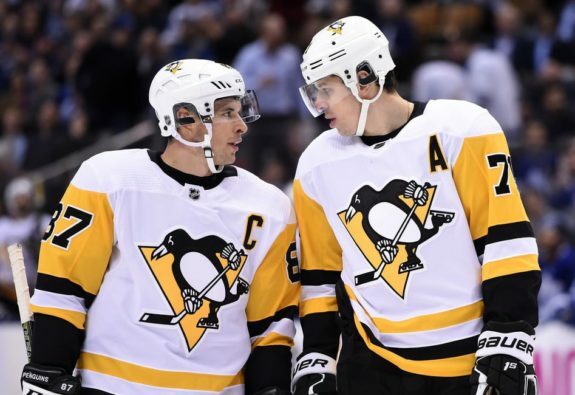 Malkin played his 100th career playoff game on April 22, 2015, and Crosby played his 100th career playoff game in the next matchup on April 24. 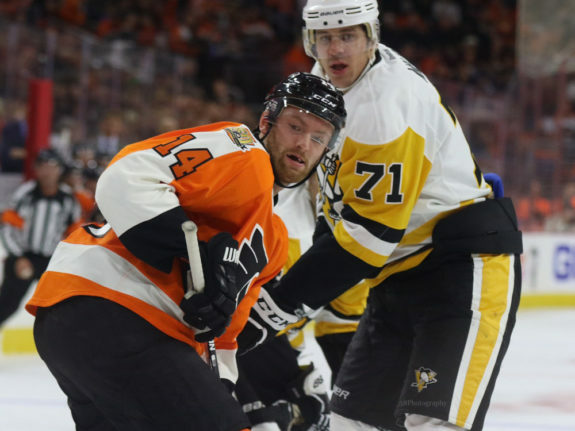 Though Pittsburgh dropped both games, losing the series four games to one with the final nail driven into the coffin by foe-turned-friend Carl Hagelin, the two-headed monster’s accomplishments are still amazing. For reference, Chris Kunitz and Rob Scuderi both played their 100th career playoff games in 2014, at ages 34 and 35, and Matt Cullen played his milestone game in 2017 at the age of 40. Things were not looking up in the Penguins crease at the beginning of the 2016 Stanley Cup Playoffs. Starting goaltender Marc-Andre Fleury missed the last five games of the regular season with his second concussion of the year and backup Matt Murray left the last game of the season with an injury of his own. 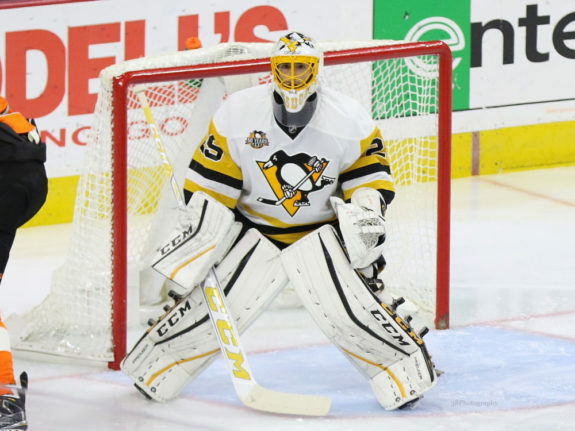 And just like that, the hopes of making it out of round one in a rematch with the Rangers rested on the shoulders of backup to the backup Jeff Zatkoff who, prior to finishing out the last game of the season with a loss, hadn’t taken the ice since February. Zatkoff was up to the challenge, pulling out a 5-2 win on home ice in the first game of the series and his first ever career playoff game. He received a little help from his friend Patric Hornqvist who posted his first career playoff hat trick the same night. Coming off the great Game 1 performance, Zatkoff and the Penguins dropped Game 2. 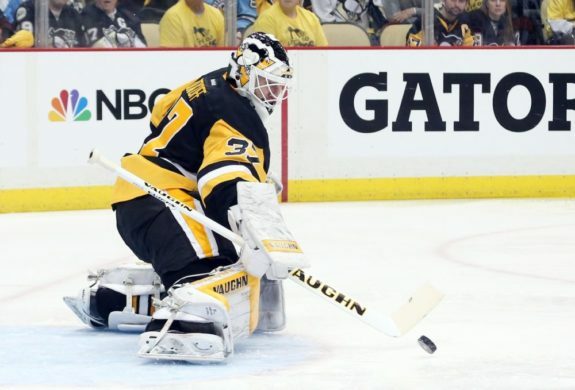 When the series shifted to Madison Square Garden in New York City, Murray was healthy enough to return to the crease and relieve Zatkoff of his duties. Murray, too, won his first ever career playoff game on April 19, posted his first career playoff shutout in Game 4, and clinched the series on home ice in a 6-3 victory on April 23, 2016. The Penguins eventually went on to capture the franchise’s fourth Stanley Cup, thanks to the efforts of Murray, Fleury, and Mr. Game 1. Penguins fans knew Jake Guentzel was going to become a household name after his debut with the team in November 2016. Though the Rangers won the game 5-2, all most people remember was Guentzel’s first time on the ice. On the first shot of his first shift, in Mario Lemieux fashion, Guentzel netted his first NHL goal, but he didn’t stop there. In 40 games his first season he scored 16 goals and 33 points and was ready for a taste of the playoffs. The Penguins were set to meet the Blue Jackets in the first round and renew a rivalry that began in the playoffs years earlier. Guentzel played his first NHL playoff game on April 12, 2017, and scored his first playoff goal in Game 2, but Game 3 was where he really came to shine. He picked up goals in the first and third periods, the second of which looked like it was going to be the game-winner until Brandon Dubinsky tied it up four minutes later. Sixty minutes wasn’t enough to settle the score, and things went to overtime. Just a little over midway through the first extra frame, Crosby found Guentzel who was able to slide one home behind Sergei Bobrovsky, complete the hat trick, and win the game en route to the second of the Penguins’ back-to-back Stanley Cup victories. The Penguins’ 2017-18 season was an adjustment period. Coming off back-to-back championships and adjusting to life without Fleury made the season feel more difficult than the standings had shown, with Pittsburgh finishing second in the Metro Division and fifth in the Eastern Conference. Pittsburgh was set to meet the Flyers in the first round, a matchup that always provides high drama after the whistle, but not usually on the scoresheet. The Penguins hit the ground running with a 7-0 shutout at PPG Paints Arena in Game 1. Crosby provided a hat trick to add to the excitement. The tide shifted in Game 2 where the Flyers grabbed a 5-1 victory, then shifted back as the Penguins snagged a 5-1 win in Game 3. The Penguins were able to win the series in six games, with Murray posting a 5-0 shutout in Game 4, and the Penguins dominating with an 8-5 win in Game 6 to punch their ticket to the second round, due mostly in part to four goals from the stick of Guentzel. On April 22, 2018, it had been 15,670 days since the Flyers won their last Stanley Cup, and as the two teams rolled through the handshake line, that streak, too, lived to see another day. The next page of Penguins history will be written in the upcoming series with the Islanders. Look to players like Crosby, Guentzel, and McCann to provide some memorable moments from the first round of the 2019 Stanley Cup Playoffs.